While one of the worst deluges leaves behind a trail of death and destruction in Kerala, an all-time high rainfall deficit in the northeastern region has made the wettest and second wettest places on earth, Mawsynram and Sohra (formerly Cherrapunjee), in Meghalaya’s East Khasi Hills district “dry and abnormally hot”. A report appearing in the The Times of India stated that according to the Met Department, it last rained at Sohra on Friday. Without the rain, Sohra registered a record maximum temperature of 30.3 degree Celsius on Sunday, 7.4 degree Celsius more than the normal temperature. The minimum temperature was 20 degree Celsius, which was also 2 degree above normal. The last high was 29.7 degree Celsius in 1995. The report further stated that the Met Department said that conditions necessary for rainfall in the region do not exist in the atmosphere at the moment. “There is low pressure over the Bay of Bengal but the movement of winds is north-westwards, away from this region,” a source said. 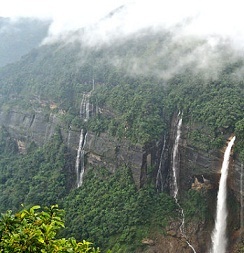 Meghalaya’s capital, Shillong, a summer getaway refuge, too is sweltering in abnormal heat. On Sunday, it recorded a high of 28.2 degree Celsius, 4.1 degree higher than its normal temperature while the minimum was also one degree higher at 18 degree Celsius than what it should have been. In the current monsoon season from June 1, the entire northeastern region has been put into deficit rainfall activity category, with Manipur being the worst hit with a shortfall of 65 per cent, followed by Nagaland with 47 per cent deficit and Arunachal Pradesh and Meghalaya witnessing 46 per cent less rainfall. The deficit is 29 per cent in Assam, 22 per cent in Tripura and 11 per cent in Mizoram.